Bare Faced Beauty Junkie: Cream of the Crop? 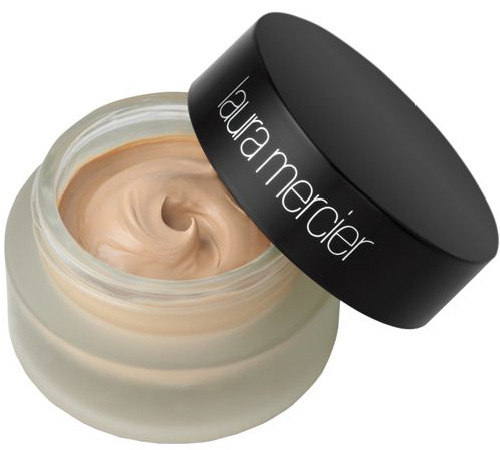 Now typically I love Laura Mericer, I only discovered her about two years ago and I think she is a really under appreciated beauty brand. I have been using this foundation for the past 18 months. Ever since I was getting ready to go to Heston's famous Fat Duck for my boyfriends 21st and realised I had left my WHOLE makeup bag at home, DISASTER. Anyway a quick dash into Space NK and this was what I left with. On a positive note the product does last forever, however mine has just run out and I have decided not to repurchase. They Say: This lightweight foundation looks like your natural skin, camouflages imperfections and gives you a radiant glow. Sheer and easy to use, this nourishing makeup is crammed full of skin-perfecting ingredients. The hydrating formula includes a multi-peptide complex infused with Dermaxyl and advanced optical diffusers that help to visibly smooth out fine lines and wrinkles. Ideal for normal to dry skin, Crème Smooth Foundation offers buildable coverage with a luminous, smooth finish. Available in 12 shades across a range of skin tones, the foundation is housed in a glass jar and comes with a spatula. I Say: The consistency is quite thick and creamy, it is almost solid looking in the jar and you can turn it upside down without any product falling out! A bit like perfectly whipped egg whites! It can be applied with fingers, sponges or brushes. In this case I think fingers or brushes work best, especially Real Techniques Stippling Brush. I simply pat the product onto my face and buffer it in with my brush. Although they describe it as lightweight, and many other people agree, I personally don't. I can really feel the foundation sitting on my skin, something I really don't like. A little may go a long way with this product but I don't find the coverage the best. I have VERY large pores and this foundation seems to settle in them, without actually covering them up, making my skin look like someone has poked holes in it. Here I have applied the foundation to the right side of my face, with nothing on my left. You can see from the previous image that I did use quite a lot of product. Whilst it has evened out my skin tone, it terms of coverage there isn't a lot of difference between the two sides of my face, and certainly nothing to get giddy about! Here I have applied the product to the whole of my face. The foundation does impart a radiance and dewiness to the skin, it certainly makes you look more awake but alas it is not the perfect match to you us oily kindred spirits. This may in part be my fault. I was in such a rush when I bought this product I had not researched it before SOMETHING I NOW NEVER DO. However I did describe to the sales assistant my skin type and she still recommended the product. The foundation is recommended for normal to dry skin types because of its moisturizing properties, so although it is not my holy grail I would be perfect for those dry skin types out there, especially in this winter weather!